Riotously funny, at the same time both quirky and silly, Monster on the Hill is a huge hit with the 10 year old and me! We each read it on our own at our leisure and couldn't help sharing our favorite pages, pointing out the fun parts that kept us chuckling. 1867 England is dotted with a resident monster in every self-respecting town -- monsters who take their monstering duties very seriously and do a great job of assisting their town's tourism: they periodically terrorize tourists and rampage through the streets for everyone's benefit. However, Stoker-on-Avon is stuck with their monster, Rayburn, who proves to be completely inept. He simply broods and stays in the pits not much unlike Eeyore, becoming a source of deep embarrassment for his townsfolk. He just doesn't have the fire in him to go on a rampage and chase the unsuspecting victim. An eccentric professor, Dr.Charles Wilke, whose experiments always go awry and whose lab always smells suspicious, is called in to cure Rayburn. Along with paperboy Timothy and Rayburn's old schoolmate, Tentaculor (what an awesome name for a monster! ), Dr.Wilke bumbles along in a bizarre adventure (with sideplots involving Timothy turning into a mushroom), providing some of the funniest pages to read. Of course, where's the villain? Where's the conflict and resolution? Well, it's in the form of Murk, an evil monster who doesn't play by the rules and wants to take over Rayburn's place. The showdown on the streets of Stoker-on-Avon is redemptive for Rayburn who triumphs in the end by proving his mettle. All in all a fantastic story with plenty for the kids to laugh about and some inside jokes for adults to nod in approval. 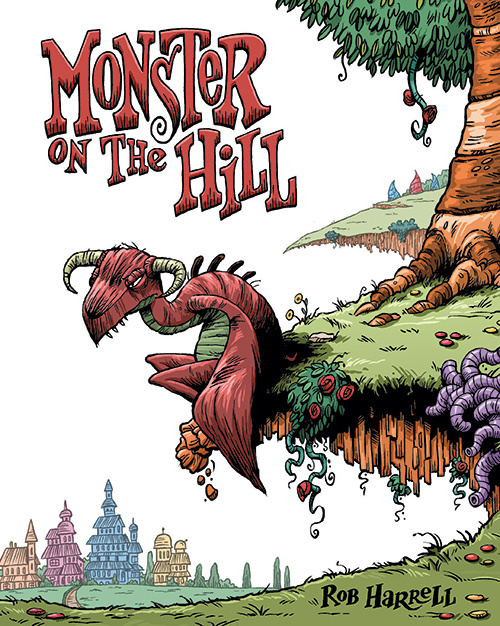 The lush landscape, the charmingly peculiar townsfolk, the at-once simple-and-complex life of the monsters all add to a very satisfying reading experience.